Why not learn to extend the hospitality of Jesus to all of your children? The goal of this booklet is to ensure that all children, regardless of disability or learning difficulty, are welcomed to faith formation and prepared for the sacraments of Eucharist, reconciliation and confirmation to the best of their ability. 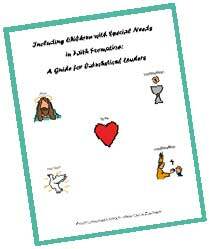 Including Children with Special Needs in Faith Formation: A Guide for Catechetical Leaders outlines clearly the ways in which children with special needs can be included in faith formation programs. It discusses various challenges with which catechetical leaders should be familiar and includes a sample registration form for children with special needs. The sacramental guidelines for the reception of the sacraments, which are included, are based on the Guidelines for the Celebration of the Sacraments with Persons with Disabilities, issued by the U.S. Catholic Bishops in 1995. It provides a concise and valuable resource for you and for your parish program. This booklet is available to download (PDF). Cost: $7.50. Purchase now.